We need to change how we change. Successful organizations are proactive about change and can turn obstacles into opportunities. Thus managing change its constant barrage, faster pace, and complexity has become a required skill for leaders, managers, and employees alike. 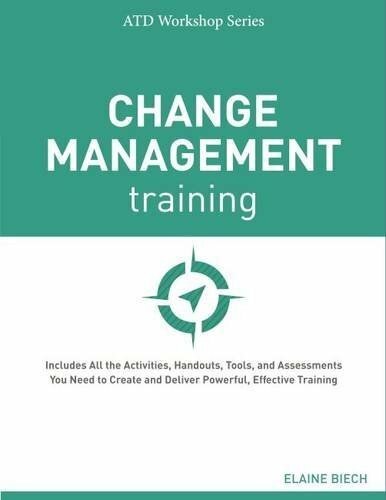 In Change Management Training, master trainer and innovator Elaine Biech presents a complete lineup of workshop resources and tools needed to conduct effective change management training. Help managers understand their expanded role, practice new management techniques, and demystify the people side of change with innovative two-day, one-day, and half-day training workshop. You'll find all the activities, handouts, tools, and assessments you need inside. The ATD Workshop Series is written for trainers by trainers, because no one knows workshops as well as the practitioners who have done it all. Each publication weaves in today's technology and accessibility considerations and provides a wealth of new content that can be used to create a training experience like no other.